After your initial import of data, you may need to add additional individuals or organizations to your database. 3. After clicking plus-button, AMO will ask if this individual is part of an organization. If they are, select from pre-loaded organizations in the list. If they are not tied to an organization, choose no organization. 4. A screen will appear to fill out some General Information about the Individual. 5. 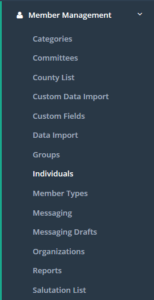 After you’ve filled in all of their information, click “Add Individual” at the bottom of the page. Once you’ve entered in the basic information about each individual, you can navigate back to their profile to add additional information in the tabs listed across the top of each profile.